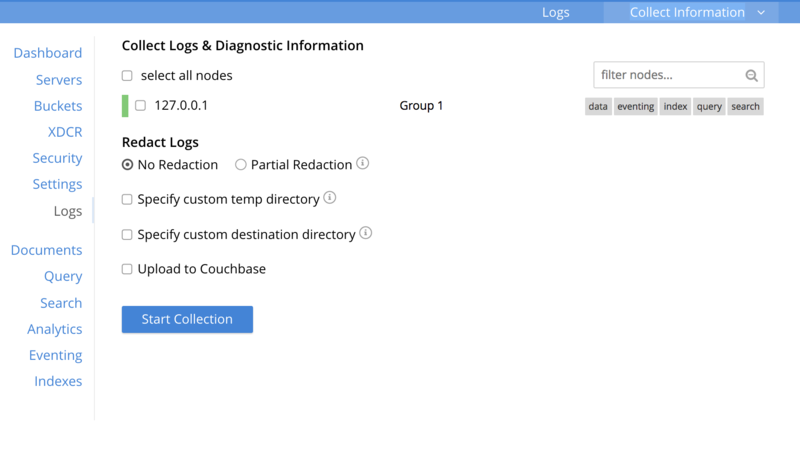 Logs allow you to identify activity and errors within the Couchbase cluster. You can view available logs and collect logs and diagnostic information from either all nodes or selected nodes in a cluster. You can also upload the collected logs directly to Couchbase Support with your data (customer name, ticket number) for easy tracking. From the Couchbase Web Console > select Logs. The two tabs are available: Logs and Collect Information. The Logs tab displays available logs by the Event, Module Code, Server Node, and Time. From the Couchbase Web Console > Logs > select the Collect Information tab. Select All nodes or Selected Nodes option from where you want to collect logs and diagnostic information. If you choose Selected Nodes, select the appropriate check boxes of the nodes in a cluster. Enter the server address in the Upload to Host box. Enter the name of the customer in the Customer Name field. Enter the ticket number in the Ticket Number field. Click Start Collection to start the collection. Couchbase Server creates a number of different log files depending on the components of the system that produce the error and the level and severity of the reported problem. Troubleshooting log for the cross datacenter replication (XDCR) component used in Couchbase Server versions after 4.0. Troubleshooting log for the view engine, predominantly focussing on the changing of partition states. Troubleshooting log for the cross datacenter replication (XDCR) component used in Couchbase Server versions prior to 4.0. Error-level troubleshooting log for the cross datacenter replication (XDCR) component used in Couchbase Server versions prior to 4.0. Trace-level troubleshooting log for the cross datacenter replication (XDCR) component used in Couchbase Server versions prior to 4.0. Unless trace-level logging is explicitly turned on this log is empty. Some logs are automatically rotated after a certain fixed size. For example, individual log files are automatically numbered with the number suffix incremented for each new log, and with a maximum of 20 files per log. Individual log file sizes are limited to 10MB by default. In this list, the oldest file has the largest number. This will rotate the debug.log at 10MB and keep 10 copies of the log (the current log and 9 compressed logs). You can use logs for multiple purposes ranging from security, monitoring, and diagnostics. Suppression of sensitive data such as personally identifiable information (PII), hostnames, internal asset information, credit card details, during the logging operation is termed as log redaction. Organizations implement log redaction as part of their legal compliance and security risk mitigations. Couchbase Server provides a capability to redact sensitive user data from getting captured in the logs. All sensitive data are scrubbed and gets removed from the log files. Post redaction, log files can be shared for troubleshooting without disregarding any regulatory compliance. 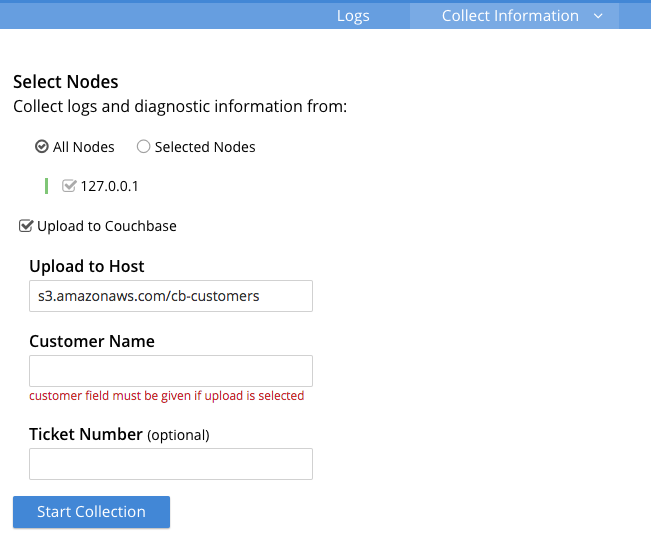 From the Couchbase Web Console > Logs page > select the Collect Information. Select all nodes or use the filter nodes… option to select nodes from where you want to collect logs and diagnostic information. From the Redact Logs pane select No Redaction or Partial Redaction option. No Redaction: Select this option to enable capturing of log data that may include any sensitive information. Partial Redaction. Select this option to enable abstraction of sensitive information in the log files. When the Partial Redaction option is selected, Couchbase automatically stores two types of files, one with redaction and another without data redaction. Use the log file without data redaction for internal troubleshooting purposes, and in case you are using the Upload to Couchbase log option, use the log file with data redaction. The above information message also gets displayed in the Web console UI. UI Message:"Couchbase Server will collect and save a redacted log file at the location you specify, but also save an unredacted version which could be useful for further troubleshooting. If you use the "Upload to Couchbase" feature below, ONLY the redacted log will be uploaded." You can change the default log file location, and change the default log levels. Note, however, that you are advised to make no such changes; and that only the default location and levels are supported by Couchbase. The default file log location is /opt/couchbase/var/lib/couchbase/logs, however, if you want to change the default log location to a different directory, change the log file configuration option. To implement a log file location change (from the default), you must be log in as either root or sudo and the Couchbase service must be restarted. Restart the Couchbase service. After restarting the Couchbase service, all subsequent logs will be in the new directory. The default logging level for all log files are set to debug except for couchdb, which is set to info. If you want to change the default logging level, modify the logging level configuration options. dynamic (on the fly, without restarting). Logging levels can be changed so that the changes are persistent, that is, the changes continue to be implemented should a Couchbase Server reboot occur. To implement logging level changes, the Couchbase service must be restarted. Edit the static_config file and change the desired log component. For example, parameters with the loglevel_ prefix set the logging level. After restarting the Couchbase service, logging levels for that component will be changed. If logging levels are changed dynamically and if a Couchbase server reboot occurs, then the changed logging levels revert to the default. log_component - The default log level (except couchdb) is debug; for example ns_server. The available loggers are ns_server, couchdb, user, Menelaus, ns_doctor, stats, rebalance, cluster, views, mapreduce_errors , xdcr and error_logger. logging_level - The available log levels are debug, info, warn, and error. You can use the CLI command cbcollect_info, which is one of the most important diagnostic tools used by Couchbase technical support.